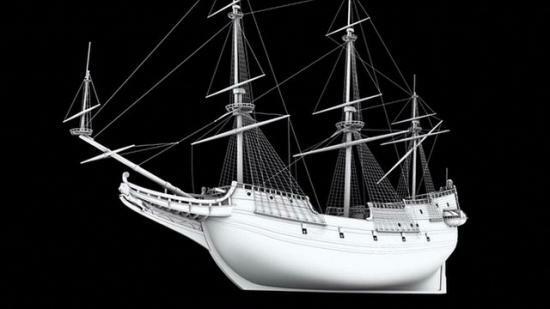 Marine archaeologists are in a race against time to preserve parts of a shipwreck they believe is the most significant found in British waters since the Tudor ship, the Mary Rose. Paul Rose, explorer, diver and presenter of Britain's Secret Seas, visited the site. 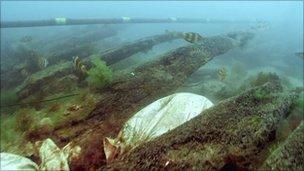 "We've watched it fall apart in front of our eyes for five years," said Dave Parham, senior lecturer in marine archaeology at Bournemouth University. "But you can only do one thing at a time." The Swash Channel wreck is an early 17th Century armed merchant ship. It was found in 7-9m of water on a sand and shingle seabed on the edge of Hook Sands near Poole Harbour in Dorset in March 1990, when a Dutch dredger hit it. It was left for almost 15 years until an assessment for English Heritage in 2005 found it was a much more significant site than first thought. Bournemouth University's Marine Archaeology programme began visiting and recording the wreck as parts of it became exposed, in work funded by English Heritage and Poole Harbour Commissioners. But the archaeologists say the wreck is disappearing as sediment, which protects the ship, has been eroding so quickly that parts of the structure are exposed and decay before they can be recorded. Divers from Britain's Secret Seas were the first team apart from the archaeologists working underwater, to see and film this beautiful piece of history. After swimming for a couple of minutes, large ship's timbers raised up from the sandy bottom by about a metre came into view, giving me a hint of the functional, beautiful lines of its bow. Surrounding the wreck site is a steel framework grid which has been built by the research team as an aid to document the excavation accurately. Countless sandbags are placed all around the exposed parts of the wreck to help to protect it from wave, tidal and storm damage. 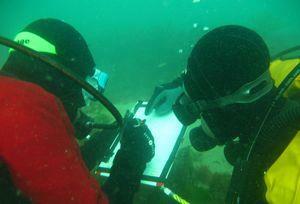 The more timbers that are exposed, the more we learn and understand about this wreck. It faces other threats - its surface is being eaten away by a small crustacean called a gribble. But it is the shipworm, a mollusc with a bivalve shell, that is boring its way in to the wood and causing structural damage to the timbers. "It's an absolute disaster, because we're not just talking about one single organism," said Bournemouth University's marine archaeologist Paola Palma. "We're talking about millions of organisms. So the damage that they cause is absolutely, you know, horrendous." The survival of rare finds, including the ship's forecastle or upper deck in front of the foremast, and rudder, have cemented its place in history as a significant wreck. Five carvings have been found so far, including a male head at the top of the rudder and another on the outside of the forecastle, which are early Baroque in style. On our dive, we moved to the stern and started dragging piles of sandbags away from one of the excavation areas, which I thought would be exposing more structural timbers. But my breath was taken away when the last bag came off to reveal the fabulous ornate carving on the rudder. I had never seen anything like it and this beautiful carving was all I needed to see that this really was no ordinary trader. We also saw pottery and canon. One carving has been raised, a merman, and is already in conservation. "Initially this was quite a small wreck of unknown character," said Mr Parham. 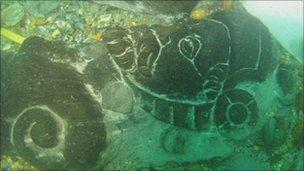 "Now we know it's a large wreck, it's a high status wreck - it's plotted in these carvings. "It's built and constructed to trade out to the tropics, in a period when this was something new. "What this ship was engaged in and other ships like it were engaged in, is the reason why we have Japanese cars and Chinese videos. "So actually, in world history terms, this is an important object." However not all of the ship can be lifted from the seabed this summer. "We're going to raise the first 12 metres of the bow. The rest we're going to bury in situ and leave it there," said Mr Parham. The remains of the wreck that cannot be brought up will be left and buried in the sands for protection. No-one has brought a wreck to the surface for 30 years in the UK - and the last time this happened it was the Mary Rose.